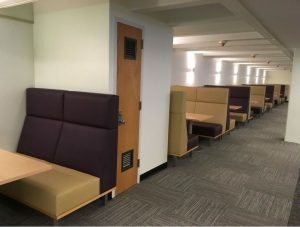 Hunter Library’s first floor has undergone several renovations this year. 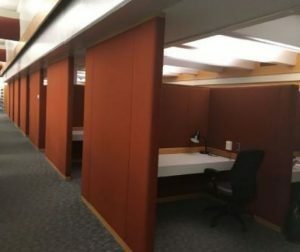 The former microfilm viewing area was transformed into group study space with large tables, restaurant-style booths, updated lighting, and additional electrical outlets. The bound periodical collection is being condensed to make room for additional group study furnishings. Current and bound periodical titles will be shelved together to allow space for collaborative space. 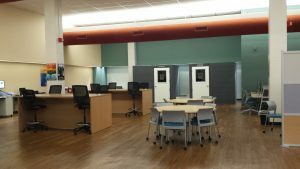 The library will officially introduce its new Scholar Studio at the grand opening event on October 24, 2018 from 1:00-3:00 p.m. The new sandbox-style space will support students, faculty, and staff in completing scholarly products. The Studio includes two recording booths with available editing software, die cut machines, button makers, a laminating machine, plotter printer, and vinyl cutter. Two virtual reality (VR) stations have also been installed near the Studio to encourage integration of this technology into instruction and learning. Stations may be reserved online and equipment kits are available for check out at the circulation desk.